The success party of Rowdy Rathore was held at Taj Land's End, in Mumbai. The lead pair of the film — Akshay Kumar and Sonakshi Sinha—were also present at the event. While Akshay wore a black shirt, Sonakshi sizzled in a short black dress. Here are the images. Bollywood actor Akshay Kumar has thanked his fans for giving Rowdy Rathore the biggest solo opening of his career. If anything makes Rowdy Rathore half-watchable, it's Akshay Kumar. But in an industry that swears by him, can’t Akki get himself a star vehicle that’s not a half-baked rehash of a zillion other films? Rowdy Rathore lets Akshay Kumar play out his engaging comic side as well as his khiladi moves to the core. And in both roles, Akshay is flawless. Sonakshi says she wants to be in limelight for the kind of movies she does and not for her personal life. Other than Akshay Kumar, what do Twinkle and Shilpa Shetty have in common? Akshay Kumar's wife Twinkle Khanna was spotted carrying a yellow Goyard bag to a movie, one that his ex-flame Shilpa Shetty too owns in the same color and style, which she was seen posing with when she took her baby boy home from the hospital. Shah Rukh Khan partied with Rowdy Rathore team — actor Akshay Kumar, Sonakshi Sinha and director Prabhu Deva, in Chennai on the day when his team won the IPL crown. Images from the party. Sonakshi says she is not waiting to get a role that will change my desi girl image, but still if she gets something, which requires her to be more westernised and her character is good she won't mind doing it. Akshay Kumar and Shah Rukh Khan partied the night away at Prabhu Deva's home in Chennai after KKR won the IPL. 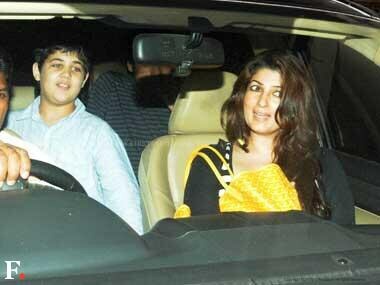 But, it was Prabhu Deva's two young sons who were missing from the party. Prabhu Deva is trying a new fusion in his upcoming 'Rowdy Rathore' by pairing leading Tamil star Vijay with Akshay Kumar in a song-and-dance. Here are a few shots of Prabhu Deva filming the sequence with Akshay and Vijay.